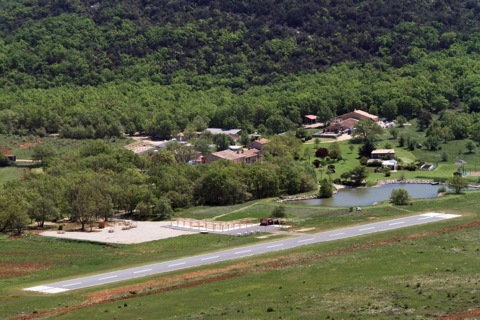 I’m going to France to host an FPV course on the RC hotel Domaine du Planet. It will be a five-day course, starting on Monday, teaching all there is to know (or all I know) about FPV. Equipment, models, technical aspects, limitations, safety, etc… Saturday-Sunday after the course has finished there is an RC-endurance contest at the RC hotel. Teams of two (or three, if at least one is a woman) try to keep a plane up for as much of 24 hours as possible. I will probably enter it with my friend Daniel, who lives down there, and we are trying to persuade my wife to join our team (although she will have to learn how to fly first). If you know French, you can read more about it here. Domaine du Planet. The hotel has everything for the RC-fantast, even a private runway and a small lake! If any of you feel like a vacation for the family and an FPV course for yourself in France in eight days, it’s not to late to sign up. Just contact Domaine du planet! Otherwise, you will at least know why there won’t be that many updates for the next two weeks, I’m quite busy! But, I promise, you’ll get a full account of the trip as soon as I get back home. Ok, I’ll make a couple of updates before I leave. I can’t leave you hanging with the sneak peak, and I’d like to tell you what I did this weekend too. Coming soon!